For reasons I don't quite understand, elementary schools make a HUGE deal out of the 100th Day of School. This year the entire school dressed up in their finest Western gear. 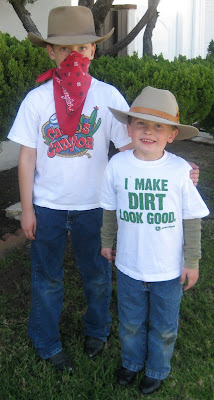 Both boys are wearing actual cowboy boots and fine felt cowboy hats, thanks to my Mom and Dad who are genuine "cow folk." They both had to bring in 100 of something to share. 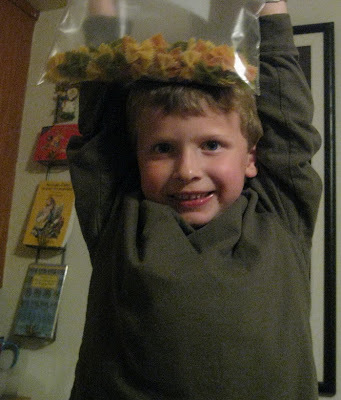 Ben brought in 100 multicolored bow tie pasta pieces, which he counted out himself. 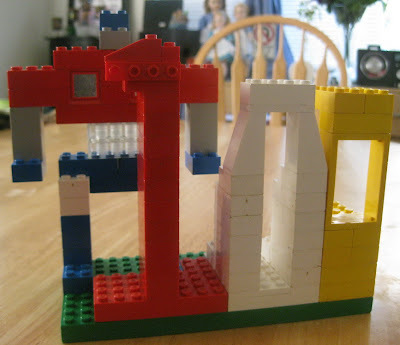 Nathan created a sculpture of Lego using 100 bricks, creatively forming the number 100. Maybe the 100th Day of School is how the teachers secretly celebrate being over halfway to summer? The 100th day of school was one of my favorites when I was teaching (in a school!) But it is kind of crazy because it was always close to Valentine's, which is close to President's day, which is close to Groundhog's day, which is close to Edison's birthday (Feb. 11, which we would do invention stuff). We always had a busy February! Anything to break up the monotony! Too bad they aren't all spread out!